When we picked out a color for the garage walls, we basically had one decision to make….what do we both look AMAZING in? It’s true. We said that out loud. We need our background to flatter, slim and basically turn back the hands of time. Paint can be like the Botox of your house. Pick the right hue and you can be paparazzi worthy. You lose ten pounds instantly, wrinkles disappear and your hair becomes better than Selena Gomez’s Pantene commercial. Suddenly you are a millennial and popular amongst people that know how to use Snapchat….paint can do that. It’s a fact. Before we got to painting, there were a few repairs to be made in the drywall. The holes needed patching and this one was especially troublesome. We tried just patching with joint compound but in the end, it didn’t last. If you have a small hole like we did then the solution are these inexpensive repair patches. They are adhesive on one side and you stick it directly over the hole and press it firmly into place. I think do a few thin coats of the joint compound to build it up and blend it in with the surrounding wall. I like this color-changing spackling because it doesn’t waste my time 🙂 It goes on pink and when it is dry it turns white to let me know it’s time for the next step. Then just sand till smooth and you are ready to go. Note the terrible haircut that I attempted to fix. I was so upset. Next time I am just gonna do it myself. I don’t need to pay someone to give him a terrible hairdo….I can do that myself 🙂 I just can’t believe that I said “I’d like it to stay long and still cover his ears” and this is what I got. Thank goodness it grows fast because Jeremy and I constantly say “He doesn’t look like HIM without his long hair!” and then I shake my fist in the air. And then Max laughs at me and I calm down. Back to the subject at hand. We covered our newly stripped floors to protect them from any paint…. as well as draping the garage doors. Jeremy and I were SO tired after the prep, we barely made it to the actual spraying. I say “we” because I peaced out while he continued but I was completely there in spirit. This is when he started – he broke out the sprayer for the ceiling and since this is not really MEANT to be a ceiling sprayer, he had to do a lot of shaking, clearing of the nozzle, refilling and such…..talk about frustrating. It also didn’t help that we had to get this all done in time for the weekend when we were gonna do the floor….we plan for bigger projects at certain times of the week because we know weekdays are filled with baseball and work and LIFE. And so in order to do the cutting in and walls later, we needed this done on a friday night. He stayed up till four am to get it all done but it was such the right decision because the ceiling needed painting. His work pants are seriously the best thing in my life. When I woke up the next morning, this is what it looked like. He had finished the ceiling (a few spots needed touchups but for the most part, it was completely white) and sprayed all the trim, doors and beadboard. That next morning my mom and dad were coming over to help with the kiddos while we finished up. Not all the trim was painted yet because of the drapes and so forth so my mom and I worked on that. See how I am clutching the ladder? White knuckles McGee. Oh and I have the best most flattering photo on the internet to show you…. At first we were a little nervous watching it go onto the walls. It’s not exactly what I would call ‘soothing’ blue….more like ‘baby went crazy’ blue. But it dried just a smidge darker and that helped us realize that it was gonna be just FINE. Especially once the floor was dark and there were more dark pieces in here with warm undertones to balance the color and make it look even more dark and saturated. After it was all painted, I then walked in and said ‘this looks terrible’ and Jeremy gave me some serious side eye and threw shade my way. With the paper floor all removed, I realized that the beadboard really needed another coat. And spraying it just wasn’t an option. I basically locked myself into the garage on Sunday and did four hours of hand brushing to get all those little beads fully covered and now I have carpal tunnel. Seriously. I knew I should have taken it in smaller chunks but yeah….DIY hurts. On the up side – it looks SO MUCH BETTER. There are still some small touchups but in general, the walls and the trim and ceiling are so light and bright and feel clean and happy. And that is exactly the kinda room I want to spend the majority of my time in! So here she is….in all her bright blue and white glory…. She has come a long way, huh?! Now to do the FLOORS! And just so you know, I may be biased but they are gorgeous. Like I feel like I am walking into a swimming pool of deep dark magna – because that is a thing that I know about. I swear. You are a goof ball in the best way possible! You’re garage is looking amazing. Wow, I not alone with painting mistakes. One question, how do you paint the top of the wall that meets the ceiling? I allows have trouble with it and end up redoing it about 4 times. I agree with the roller not taking enough paint. Your garage looks great ! I think the blue is great! Keep in mind you’ll have all your tool storage and work bench in front of it.. You’ll probably see a lot less if it! 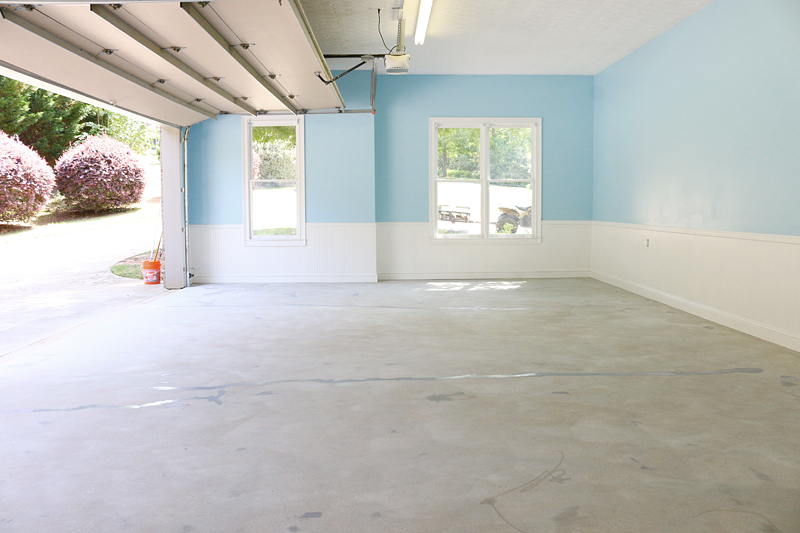 I love it… Now I wanna paint my garage! Love it! And I agree on the two coat rule! This space doesn’t even seem like a garage anymore. You seriously need to send some of that energy my way. Great job! I am with you on the two coats of paint. I have yet to see one ever look good enough. Lots of hard work. But eeeekkk! That blue is bad! Well, hats off to you for a job well done! I love the blue and white, so clean and fresh. Happy new week! You may hate it but in color for pictures it looks amazing. Just check out my Instagram for sneak peeks! OK. I think the blue and white is brilliant. I think LJ is as adorable as can be even if his hair is shorter than you would like. You can’t mess up perfection, right? And the two coat rule is tried and true. Gotta do it to make sure all is painted well! I can’t wait to see the floor. Our garage is beige. We painted over builders white. No way it looks as fabulous as yours, but we can live with it, because all we do is park our cars in it and use it for storage. Keep doing what you’re doing Bowers!! Love you guys!! Isn’t the paint glidden, not valspar? It’s a Valspar color that we had color matched to Glidden paint. Sorry that was confusing! Looks great! Nice blue, but what is magna? Bright and clean and fresh and awesome! Looks good! 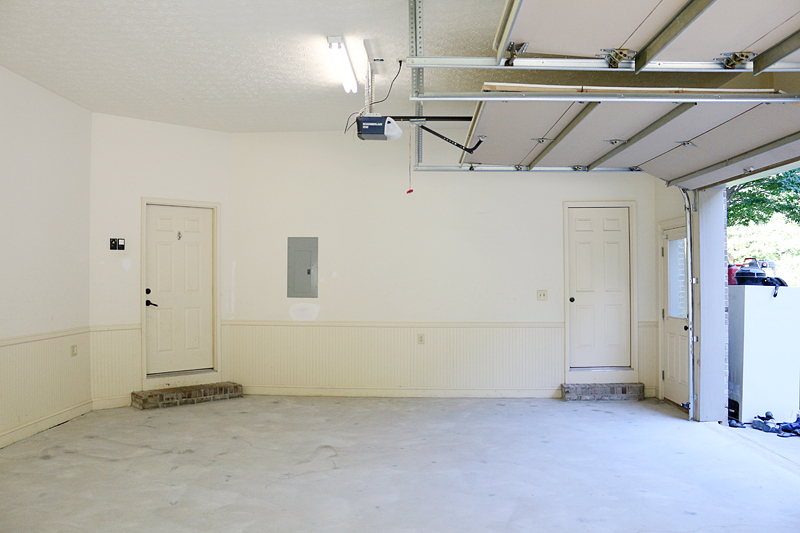 The garage is a space that we see multiple times EVERY DAY…and yet, still the grossest place in our whole house. I’m interested to see what you do with the windows. We have mini blinds on our garage windows and they are the most disgusting things in the entire planet. Behind the tool chest and work bench, so impossible to get to and clean (not that THAT would happen anyway). I’m thinking of using frosting film to provide privacy (don’t want everyone seeing our mess and breaking in to steal half gallons of used paint) but still let the light in. I like that idea! I think for us we are gonna do roller shades that diffuse light when down…it would be a good solution for video. You may have the fanciest garage ever! LOL! Ours doesn’t even have drywall.